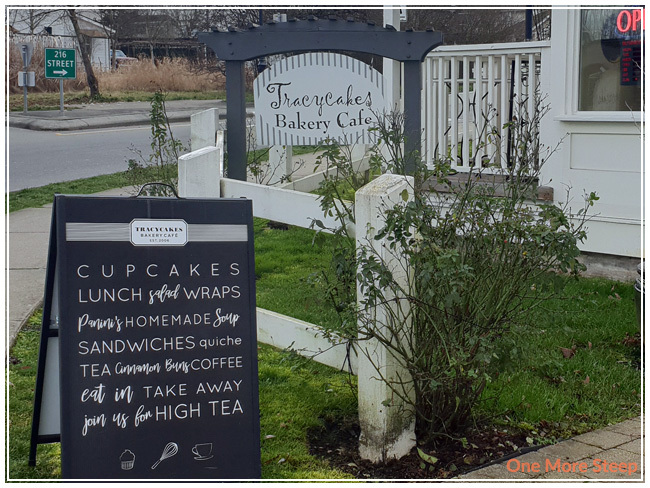 I recently had the opportunity to have the Signature High Tea at Tracycakes Bakery Cafe, located in Murrayville, Langley. There is also another location of Tracycakes, which is located in Abbotsford, BC. 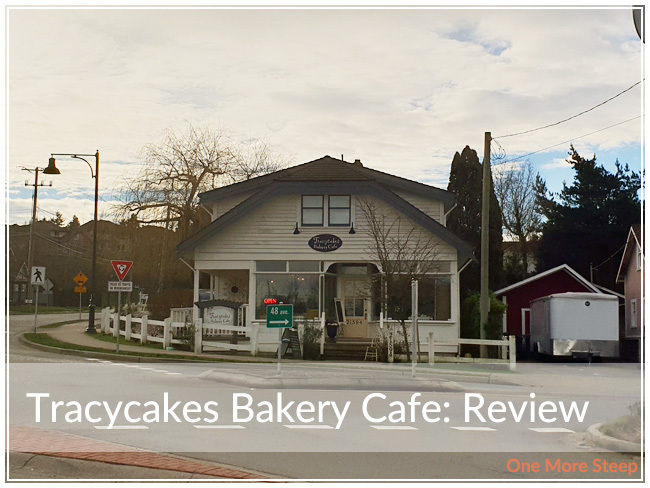 Tracycakes is located in a quaint little building at 5 corners, which is a 5-way intersection with a roundabout in Langley, BC. The intersection is historic, with some of the buildings lovingly kept up for over 130 years. Inside of Tracycakes, there’s cute table settings on each of the marble topped tables, with chalk artwork throughout. Copies of newsarticles about Tracycakes adorn the walls, with a long, comfy benchseat along one wall. There’s meal options, along with the Signature High Tea, on the menu – and you can also order food to-go. The dishes for our table settings were white and stood out nicely against the white and grey marble table top. 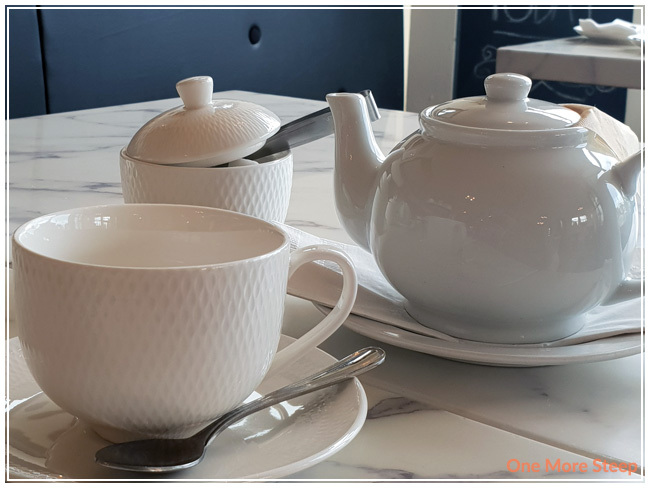 My friend and I both ordered the Signature High Tea, which came with a top of tea for each of us – she had the Cream of Earl Grey while I had the Earl Grey Lavender. Both of which are black teas and quite traditional for afternoon tea. There was also sugar bowls on the table with silver tongs, and a miniature pitcher of milk. The lavender aroma from the Earl Grey Lavender stood out quite nicely. And then there was the food! There were two tiers -sandwiches and savouries on the bottom with the pastries and sweets on the top. 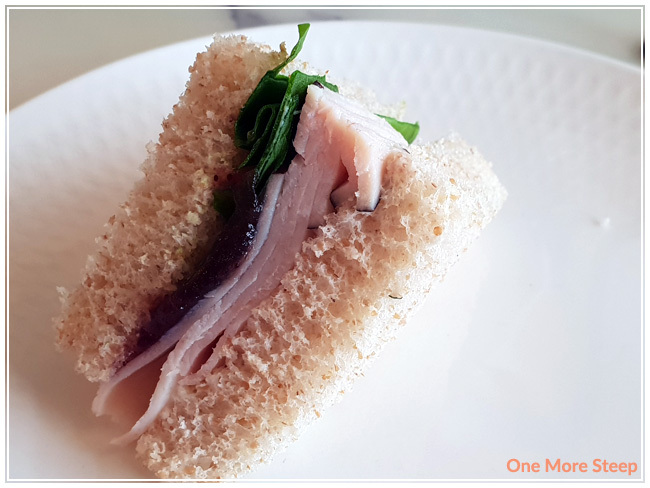 For the sandwiches, we each received a quarter-sandwich of egg salad, cucumber, tomato & basil, and turkey & cranberry. What I found interesting was that the egg salad had white bread on one side and whole wheat on the other, although it didn’t really affect the taste too much. My favourite of the four sandwich offerings was the tomato and basil because the basil was just so flavourful. 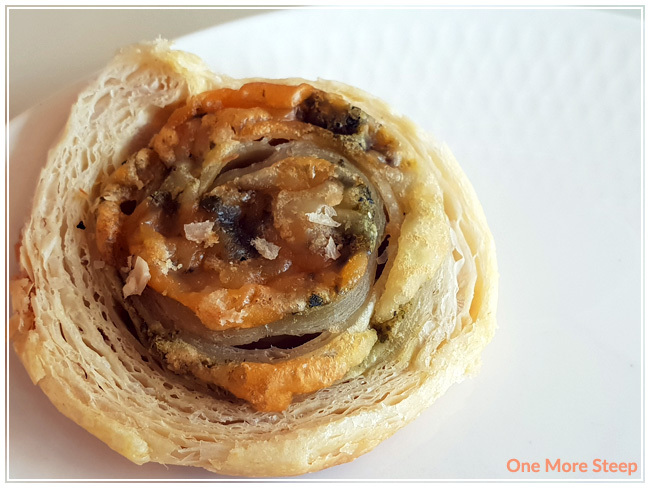 With the savouries was also a savoury palmier, which consisted of basil and cheese. This was really nice, had a nice crisp to it with a nice salty quality to it, thanks to the cheese. And now… the sweets! 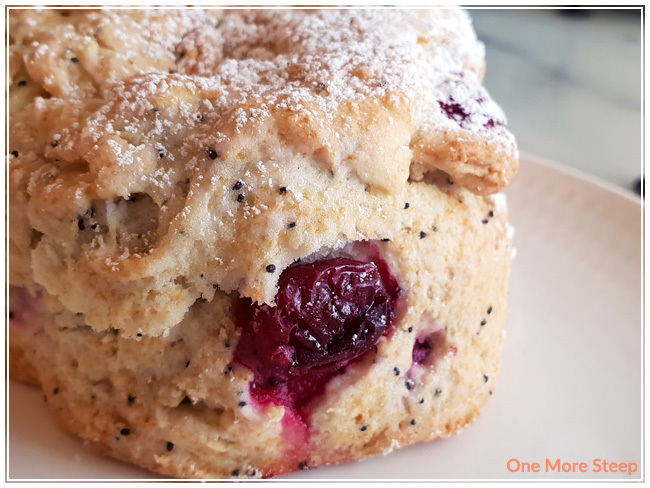 Starting with the confectioner sugar dusted scone, the scone was loaded with poppyseed and cranberry. The cranberries themselves were a touch tart, but it balanced well with the sweetness of the confectioners sugar. To pair with the scone, Tracycakes included devonshire cream, raspberry jam, and lemon curd. I opted to pair my scone with devonshire cream and raspberry jam since I decided the lemon curd may be a bit much with the cranberries in the scone. We each got a brownie square, which I found to be very sweet with the icing on top. For someone who loves sugar, I was just not feeling it that morning. There was also a variety of cupcakes. One of them was vanilla and coconut, while another was vanilla and lavender. My friend had the lavender cupcake but said she couldn’t really taste the lavender. I found the coconut one to be very rich in flavour for both the frosting and the cake itself, it was really tasty and I would go back for a cupcake. There was a small triangle cookie, which I believe to have been a sugar cookie. Also had icing on top, very sweet – but had a great buttery flavour to it and was flakey, so I definitely enjoyed that cookie and it was one of my favourites of the sweets tier. Throughout both tiers, we had some fresh fruit (primarily sliced strawberries, with a couple of blueberries), which was nice considering it can be hard to find nice fresh fruit with the current season. 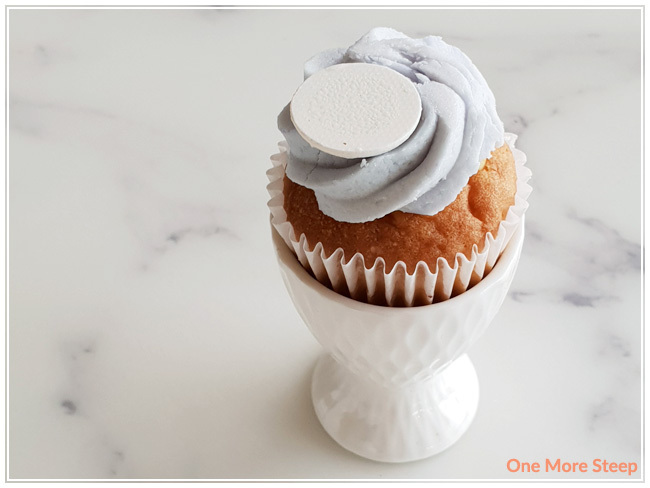 I really liked Tracycakes’ creative use of egg cups as containers to hold the lemon curd and one of the cupcakes, it just really added another level of whimsy to it. Tracycakes wasn’t too busy when my friend and I first arrived, but the cafe was quite bustling with activity by the time we had left – with plenty of reserved signs on tables for people wanting their own high tea on a Wednesday. 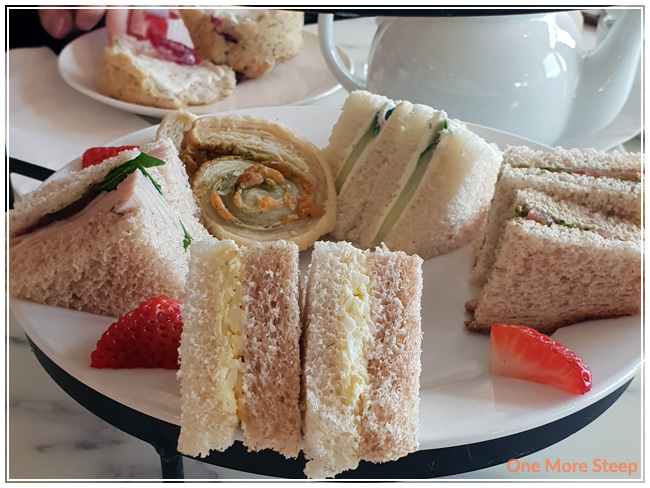 I really enjoyed the variety in food that was offered with the Signature High Tea, and found that the flavours were overall enjoyable. 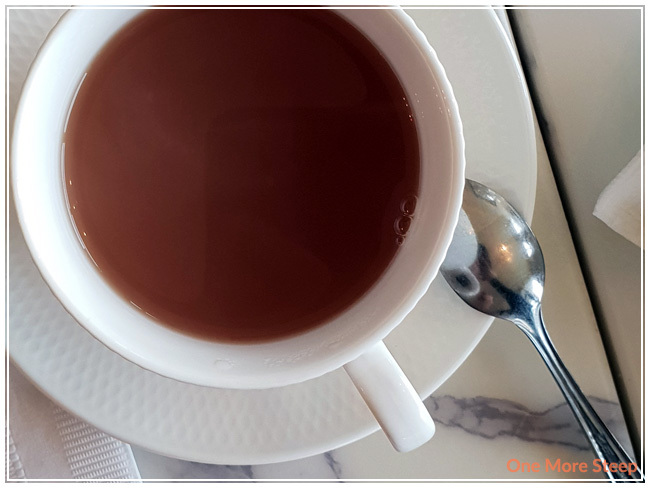 I really did like my tea selection (Earl Grey Lavender), and found that it worked well with a little bit of sugar and milk – although the lavender flavour and aroma was quite strong without any additives as well. 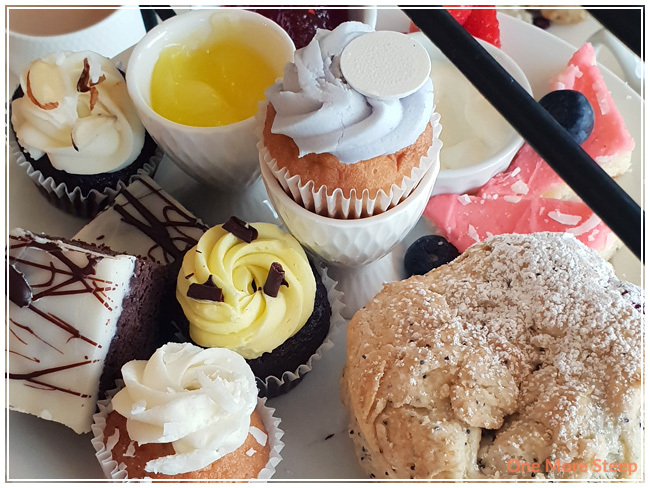 For the price, I definitely think that Tracycakes puts on a good Signature High Tea and would go again. It seemed like quite a child-friendly location – there were a few tables that had babies and young children – so it’s an option for those who maybe don’t want to take their kids to a location with a lot of vintage tea cups everywhere.